Types of Art: According to Siroto (1979 and 1995), there are three main types of Kwele mask: 1 - Bush spirit masks, ekuk, which are divided into white-faced masks that function as guardian spirits and animal masks, kuk-guu (a flying squirrel or spiny-tailed squirrel) and kuk-diityak (an owl, also known as a "witch's chicken"); 2 - Gong masks, which resemble male gorillas; 3 - Helmet masks with multiple faces, Ngontangang. Fig. 13: Mask with Encircling Horns. This author believes that the round masks with human faces whitened with kaolin are not ancestor masks as they are generally called, but are instead representations of bush spirits, which act as intermediaries between the world of the bush and that of the village. White coloring on other masks from Equatorial Africa is associated with death, but for the Kwele it symbolizes light and clarity, and hence the clairvoyance needed to combat witchcraft. The symbolic ambivalence of white coloring is found elsewhere: a white mask from the Ogoou� region represents a spirit with special clairvoyant powers, which returns to the village from the realm of the dead through the supernatural world of the forest (ngontang and ngil masks, for example). There is therefore no symbolic incompatibility between bush spirit masks and ancestor spirit masks, since the latter can assume the appearance of the former. This convergence is realized in masks that combine zoomorphic and anthropomorphic elements. Some masks seem to be male (the animal masks) while others are more female (the round masks), but only the former were used in solo dances. It also appears that the houses used for the beete cult or initiation rites, even if they were temporary structures built specially for the festivities, were hung with unactivated masks, which resembled the others but had no eyeholes and therefore did not develop the patina that comes from being worn. Even discounting these little-handled examples, it has been observed by various commentators that few Kwele masks are really ancient (i.e., earlier than 1920). Most of the pieces known today were collected between 1920 and 1935, a period when Kwele carvers were still at the height of their technical and artistic powers. Such artists could respond quickly, and sometimes well, to the demand from European travellers interested in African objects. There is little doubt that a number of Kwele objects in Western collections were not made for ritual use in the nineteenth century. 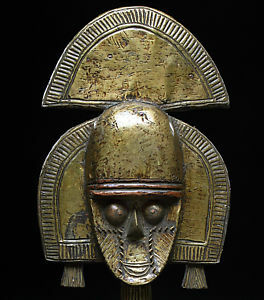 Ingeborg Bolz (1966), in a study of Gabonese sculpture, cast serious doubts on the strictly ethnographic authenticity of many Kwele masks. Without being so severe, it should be recognized that some recently made objects were used for entertainment outside a traditional ritual context, or were even commissioned by Europeans. History: According to oral tradition recorded by various researchers (Siroto, Deschamps, Perrois), the Kwele, whose lives are closely linked to those of the people of the Ogoou� River, once lived along the Ivindo River and its tributaries in northeastern Gabon, beyond present-day Makokou and southwest of their current concentration. There are still a few villages there today, north of B�linga and Mvahdi, the colonial outpost of the Gabonese Kwele in the 1930s. Tragically, the ebola virus is now endemic in the area. The oldest village is called Ekuk-Mbol-N�-Begel. It is located on the upper Ivindo, in a remote region of barren mountains rising above the forest. According to legend, the pressures of incoming migration drove the inhabitants across a broad river with the aid of a mythical snake, a tradition similar to that of the Beti-Fang. In earlier times, groups of Kwele had been displaced by the Fang, either toward Gabon or the Congo. Kwele, Mahongwe, and Kota traditions all have their own versions of a great war that involved them all and left severe scars. This is known as the "Poupou" war, which probably took place in the early nineteenth century. In Kota and Mahongwe tradition, Poupou was the name of a legendary Kwele war chief; among the Kwele, it is believed to have been the name of a Nyem warrior (Deschamps, 1962). Related to the Makaa in Yokadouma region in southeastern Cameroon, the Nyem were displaced by the great migration of the Fang (Bulu, Beti, Ntumu, Betsi, etc. ), and in turn forced the Kwele groups southward into a marshy, forested region then only sparsely inhabited by Bakola Pygmies. As they fled, some groups of Kwele headed towards the Dja River (which becomes the Ngoko River downstream), others towards the Sangha (via Souank�, Semb�, and, finally, Ouesso), and still others toward the A�na (which becomes the Ivindo downstream) and east Gabon along the Djou� and Djaddi� rivers. Thus, in the nineteenth century, the Kwele split into two subgroups that have become almost separate entities: the western Kwele in Gabon and the eastern Kwele in the Congo. The latter seems to have kept its ancient traditions alive longer than the former, especially the art of mask carving. Political Systems: Like the Kota and Fang, they are organized in a patrilineal kinship system and are divided into about thirty exogamous clans. Their political system emphasizes the power of the war chiefs (who are often also village chiefs), probably because of continual warring with their neighbors. It depends less than most other traditions upon elders of the lineage or clan. These warriors, who are called ngeng, play a vital role in protecting the community against incessant attacks. The Kwele were overtly polygamous, and wealth and social prestige were measured by a man's accumulated number of women and children, because these represented potential for the labor required for the communities to survive. The major functionaries in the villages were the traditional medical practitioners, or healers and diviners, who officiated in religious ceremonies (gaa, pl. begaa-see nganga among the Kota and ngengang among the Fang), judge-mediators who moderated the many palavers (tepep), and the war chiefs (ngeng, pl. bengeng). The latter, a sort of war lord, imposed his "protection" on a village or even over several neighboring groups by physical force and magical practices. Poupou, the ferocious warrior who once terrorized the Kota and the Mahongwe, was a ngeng. Given the political instability prevalent throughout the region, it is easy to understand how these war chiefs were able to play such a crucial role in Kwele society. "The political power exercised over the village was vague and transitory" (Siroto, 1972). There was considerable latent conflict between rival communities among the Kwele, with the submissive groups attempting to free themselves and the dominant groups striving to maintain their leadership. Even when there seemed to be no issue, groups who wanted to break free would leave to try their luck elsewhere, sometimes settling among neighboring peoples. As among the Fang and the Kota, the segmentation of Kwele family lineages has been almost continuous since at least the nineteenth century. As a result, the outward signs of their identity-the relics of the dead-were gradually dispersed. These bones were charged with symbolic meaning and were required for religious rites as well as the successful practice of witchcraft. There were powerful socio-religious tensions in Kwele society that sometimes erupted into conflict and violence. Thus the role of the tepep was central in that it served as a guarantee of the groups' survival. The main concern of all nobles, including village and clan chiefs, was to keep the communities united and at peace. The beete, a ritual that served this end, was performed at more or less regular intervals and was a valuable tool in the process of social regulation. Religion: In the context of the civilizations of the Ogoou� basin (which include the Fang, Kota, Tsogo, etc.) and assuming reasonable contact with these peoples, it is difficult to believe that the Kwele would not similarly have venerated ancestors and kept the relics of the dead of the lineage. Indeed, each lineage kept the skulls (edim) of important deceased members of the group in baskets, a practice similar to that of the Kota and the Mahongwe from M�kambo. These reliquary baskets were apparently decorated with "carved wooden heads" and were placed in the living hut behind the bed of the head of the family (Deschamps, 1962). In this proximity the ancestors could advise the head of the family in his dreams and reveal the future. The "Mademoiselle"* cult, an iconoclastic movement in the 1950s led by an inspired Kwele prophet from the Souank� region, encouraged the destruction of all ancient ritual objects likely to be used for witchcraft throughout the Ogoou�-Ivindo regions and northern Gabon. Why Kwele reliquary figurines were not collected before the advent of "Madamoiselle" remains a mystery.